The ongoing counter-insurgency operation in the Kanjikudichchi-aru jungles has entered a decisive stage with police commandos targeting small groups of terrorists operating in the area. “We are actually in the third phase of the offensive,” a senior para-military officer told The Island yesterday. 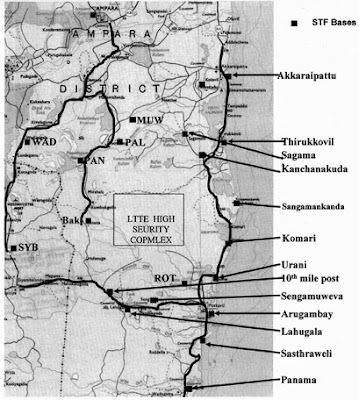 Although commandos engaged in the offensive forced the LTTE to abandon almost 20 bases along with a large quantity of supplies, small groups are believed to be re-grouping. The current phase of the offensive was aimed at wiping out them, he said. Aggressive patrolling would continue to seek out and neutralize the enemy units. Commandos on Thursday engaged two enemy groups at Udimbikulam and Darampalawa. According to the STF official commandos the first contact had taken place at Udimbikulam where commandos overran an LTTE hideout subsequently identified as Jeevananda base. “We hit them hard,” the official said that subsequent inquiries revealed that five LTTE cadres had succumbed to their injuries. Commandos had recovered one multi purpose machine gun with 300 rounds of ammunition, 24 hand grenades, two communication sets and a large stock of rice, dhal and sugar. The second confrontation had taken place at Darampalawa where police commandos ran into an LTTE ambush. One commando had been wounded and evacuated to the government hospital at Ampara. His condition is reported to be stable. Commandos had also located a caterpillar and an earth moving vehicle near the LTTE base located on January 29. The official pointed out that there was a huge difference between jungle operations and fighting in built-in areas. Since the launch of the offensive the LTTE threat on Sinhala and Muslim areas had lessened, he said.